This post is an attempt to answer a practical issue faced when we try to estimate the process capability of a process for parts that "can be" oval in nature, but not necessarily expected to be oval. Let's take an (exaggerated) example, for the sake of visualization of the concept. 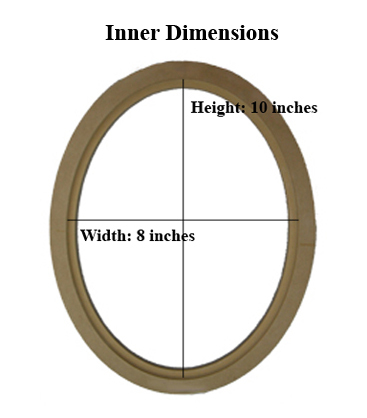 The customer has specified that the inner diameter of a ring should be 9 inches, with a tolerance of +/- 1 inches. However, let's say e measured a manufactured part and found it to be oval, with a minimum internal diameter of 8 inches and a maximum internal diameter of 10 inches. In a typical process capability study Cp and Cpk are estimated based on measurements taken in a single direction, on multiple samples manufactured from the same process. Draw multiple samples from the process. Measure the height and width inner diameter of each ring. Important: Do-not take average of the height and width. Test for stability of measured height and width diameters separately - If you are using Minitab, this step is built in in the Minitab assistant feature. Now, the above calculations are good for an internal quality department interest. However, the customer may be interested in only one value of process capability, and not separately for height and width dimensions we defined above. Going by the understanding of why Cp and Cpk are calculated - Cp is calculated to get an estimate of % out of spec, assuming the process is centered; and Cpk is measured to get an estimate of % out of spec irrespective of whether the process is centered or not. One approach could be to convert the above height and width Cp and Cpk values to equivalent DPMO or % out of spec, and then add them up, then reverse lookup for equivalent Cp and Cpk values.